Interior design encompasses much more than just decorating. Comprehensively, it includes everything from the interior architectural layout of a new custom home – or remodel – to the complete re-design and build-out of a new kitchen or master bedroom and bath wing. It can also be as simple as updating a room with a ‘fresh new look’ with flooring, furniture, paint, window treatments and accessories. Innerspace Design has the experience, expertise, and the alliance with quality contractors and specialty product suppliers to successfully accomplish any level of design need. Consultation – All design work begins with a consultation – it is the initial step where you and the designer meet and discuss your specific design goals and budget ideals. 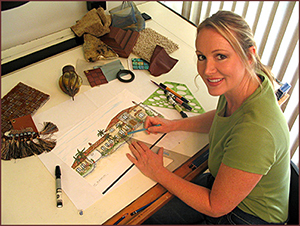 Concept Development – Creative concepts and initial design directions are explored in drawings and color renderings to convey the designer’s stylistic and/or architectural ideas. Spaceplanning - occurs ‘hand-in-hand’ with concept development…Here appropriate, functional layouts are created to indicate the new spaceplan that will best suit the needs of the client and the objectives of the design. Lighting Design is incorporated at this time as well. Material Palette Selection – finish materials / products / and color palette are selected to exemplify the style of the design and remain within the established budgetary level. Construction Documents – once the final layout is established and the finish materials and products are selected, technical construction documents can be prepared by the designer. These drawings provide the necessary information to secure relevant construction and fabrication bids from subcontractors. Innerspace Design will assist the client in evaluating the bids and helping the client get the highest quality service at the best possible rate. Product / Material Acquisition – As desired by the client, the designer will purchase and acquire the necessary finish products, materials, furniture, lighting, artwork, plants and other accessories for installation in the project. Beyond the benefit of having the designer responsible for the proper acquisition of these items, there is a purchasing incentive extended to the client. Project Management – Encompasses construction meetings with Contractors prior to, and during, the build-out of the new design. Construction supervision by the designer is crucial to ensuring that the work is being done in accordance with the design intent. Personal Shopping for the Final Details – Acquisition of the “finishing touches” – the perfect orchid, color-coordinated candles and towels, a unique urn, and selecting the right plants and artwork to give the new space the right "personalized" look and feel for the client.